Conference and Event Management Training Material is made for trainers to help build the skills for event management for supervisors and managers in the workplace. Train your employees the essentials for event planning, creating a committee, how to connect with partners and sponsors and so much more! Seeing is Believing This sample manual to teach Conference and Event Management is in MS Word format. If you've ever been to a conference, then you can imagine how much planning has to be done prior to an event for it to go as smoothly as possible. Do you know how to draft an agenda, secure sponsorship, and market your event? What happens if you go over budget, and who's on hand the day of the event to handle any last-minute emergencies? 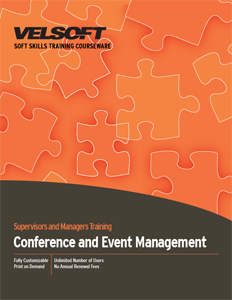 Velsoft's event management training material makes it easy to teach all of this and more. With customizable courseware and thoroughly researched, up-to-date content on the best planning methods and techniques, it's never been simpler to teach students how to create memorable events. In this two day workshop, students will learn how to appreciate the fine details of planning, budgeting basics, venue and food selection, how to coordinate volunteers and committee members, how to create a conference report, and more. Whether they're planning a meeting, conference, or party, events will turn into a breeze with the right skills! Trainers gain access to a customizable instructor's guide, student manual, PowerPoint presentation, and more, all of which can easily be combined with eLearning in a blended learning environment that enables students to work through the material independently, or in combination with classroom instruction.